Have you ever noticed when it comes to setting fitness goals your motivation is always so high at the start? You get this feeling that you can accomplish anything no matter what. Nothing is going to stop you! It’s always like that at the start. You’re motivated and your hopes and dreams for the future seem bright. It’s all going as planned until BAM! You hit some major resistance. Then it’s like your motivation starts to slowly decrease day by day, hour by hour. You start to notice that you’re getting back to your old habits, the cravings are getting intense and the lethargic energy that prevents you from exercising is back. Don’t worry you’re not alone with this, it happens to all of us. One second we’re doing great and the next the rug gets pulled out from under our feet. It’s natural to start any process with high amounts of motivation only to see it slowly dwindle away. That’s why I’ve put together a list of 3 principles that I use to help me keep my motivation levels where I need it. You can use it to keep you going when times get a little rough and you need an extra boost. 1. Release the pressure of perfection. Nothing stifles motivation more than the desire to do things perfectly. It prevents us from taking action due to the paralyzing fear of not fitting this self imposed idea of perfection. It also guarantees that you’ll feel discouraged at some point even when you’re making progress. That’s a boat load a pressure that you don’t really need. This mindset will not serve you on your journey and it really does more harm than good. So let it go, you can do it. 2. Celebrate every small success. Did you make it to the gym today? Celebrate it. Did you walk a mile? Celebrate it! Did you reach a major goal or accomplishment? Then you need to go right now and celebrate it. You see when we don’t celebrate the small victories we end up feeling like we haven’t really accomplished anything. This makes it harder for us to keep going. Every little success is a step closer to your goals. Each step provides a little burst of momentum that keeps you moving forward. Recognize that progress every step because no success is too small to celebrate. 3. Remember your reason why! What’s the big picture here anyway? Are you just working out to lose a few pounds or are you making lifelong habits that will have a tremendous impact on your life? 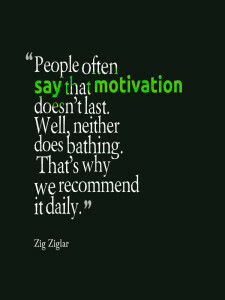 The reason for doing something, your why, has the biggest effect on the motivation you put forth. Wanting to be a good role model for your children or wanting to achieve your full potential are great reasons as to why you need to keep moving forward because it has more to do with an internal drive to be better rather than just to look better. Though looking better will be the end result, you need to have a strong enough why to keep moving forward when the times get tough. When you reach that struggling point and we all will, remember to let go of any ideas of perfection, celebrate every small success and keep reminding yourself of your reason why because you are worth the work! I hope this can help you on your journey and if there’s anything else I can do to help you along, please let me know. Move Well and Live Better! Are you tracking your Heart Rate Variability?